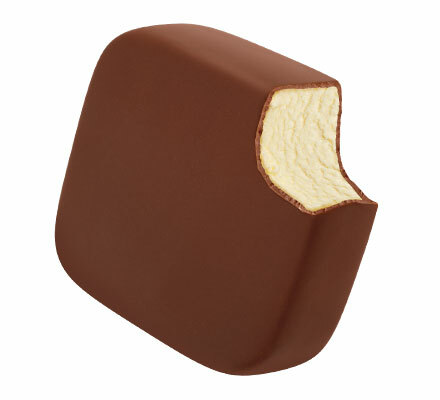 Creamy vanilla flavored reduced fat ice cream square dipped in chocolate flavored coating. Case Dimensions: 9.8125 in. x 7.9375 in. x 5.625 in. Ingredients: Reduced Fat Ice Cream (Milk, Cream, Sugar, Corn Syrup, Skim Milk, Whey, Buttermilk, Contains less than 1% of Vanilla Extract, Artificial Flavor, Mono And Diglycerides, Carob Bean Gum, Cellulose Gum, Carrageenan, Vitamin A Palmitate). Coating (Coconut Oil, Sugar, Milk, Chocolate Liquor, Cocoa Butter, Hydrogenated Coconut Oil, Soybean Oil, Whey, Cocoa Processed with Alkali, Soy Lecithin, Salt, Vanillin). Allergen Information: Contains Milk, Soy. May contain Almonds, Cashews, Egg, Peanuts, Pecans, Wheat.